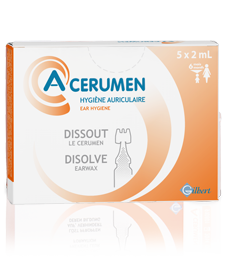 A box of 10 single doses of A-Cerumen provides five days of intensive treatment. A tried and tested way of eliminating earwax plugs without waste. On existing earwax plugs: for three to four days, morning and night. 1 - Tilt the head to the side which is not being treated. 2 - Squeeze half the contents of a single use dose into the ear. 3 - Massage the base of the ear. 4 - Return to upright position and wipe any excess product which might drip from the ear after use. Warning: once opened, single doses must be used within 24 hours.